This is a satisfying, nutty flavored salad using farro with cherry tomatoes, spinach and shaved parmesan. It’s tossed with some minced red onion, crunchy walnuts and a red wine vinaigrette with a garlicky kick. Farro is a hearty, chewy whole grain that has a nutty taste and is very filling. I’ve kind of missed out on farro since it’s been very hard to find at the supermarket. But recently Trader Joe’s started carrying a great line of par-cooked grains and it includes farro. So now it’s not only easy to buy but it’s also easy to cook – it only takes 10 minutes vs. 30 to 40 minutes for regular farro. This is a simple dish that works well as a main salad or as a side salad. It comes together quickly if you’re using par-cooked farro. This salad is also a great base – so if you have anything that you want to use up in the fridge then go ahead and add it in – some cucumbers, olives or roasted red peppers would all be great additions. I love it when you find something new that you can add to the dinner and lunch rotation – and I’m going to be using farro a lot more in my recipes. I love the chewy texture and nutty flavor of farro. I’m planning on trying different farro salads in the future, as well as farro risotto, farro casserole and much more. I’ll keep you posted. I used Trader Joe’s farro that is par-cooked. It only took 10 minutes to cook and I cooked it like I would cook pasta – in a large pot of boiling water until al dente. Please cook the farro you buy as per the package instructions – if it’s not par-cooked it will take longer to cook. This recipe holds up well in the fridge – so make some for dinner and use the leftovers for lunch the next day. For the shaved parmesan, use a vegetable peeler to thinly shave off slices of parmesan. If you don’t have parmesan then try using some feta cheese instead. For a vegan version of this salad, switch out the cheese for olives. If you soak your red onion in a little cold water before mincing, it will remove some of the harsh raw onion taste. Adapted from this recipe on the NYTimes Cooking site. Have you been on the new NYTimes cooking site? 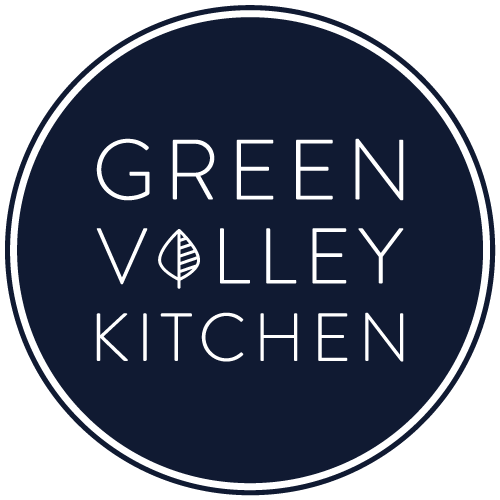 It’s a wonderful resource with tons of great recipes – so go check it out. 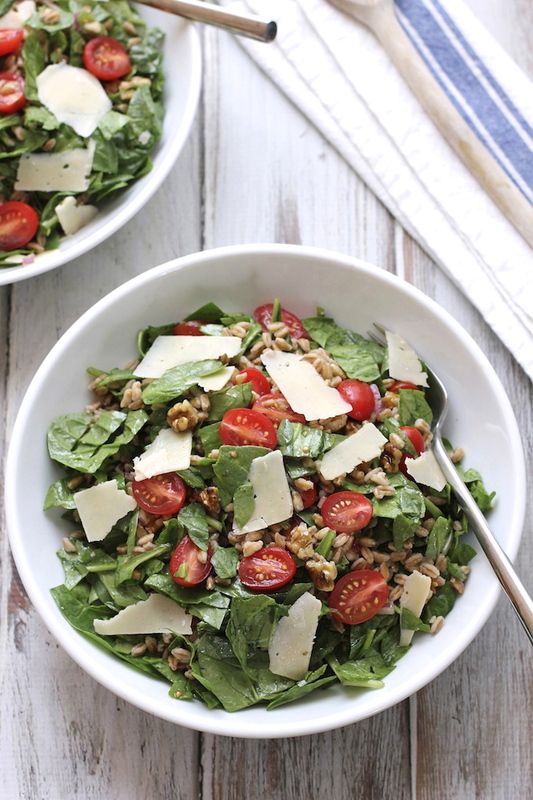 Farro with cherry tomatoes, spinach and shaved parmesan. 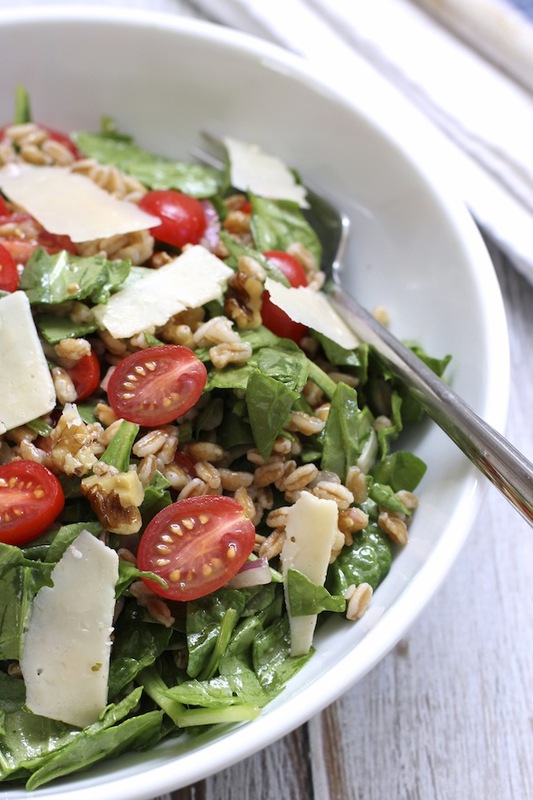 A filling and satisfying salad featuring nutty, chewy farro. Cook farro as per package instructions. Add one veggie bouillon cube to the water. Slice cherry tomatoes in half and add to a large salad bowl. Roughly chop freshly washed spinach and add to the salad bowl. Mince red onion and add to the salad bowl. Add walnuts to the salad bowl. Using a vegetable peeler, shave thin slices of parmesan cheese and set aside. For vinaigrette, whisk together olive oil, red wine vinegar, minced garlic, black pepper and salt. When farro is ready, drain, rinse under cool water and allow to drain thoroughly. 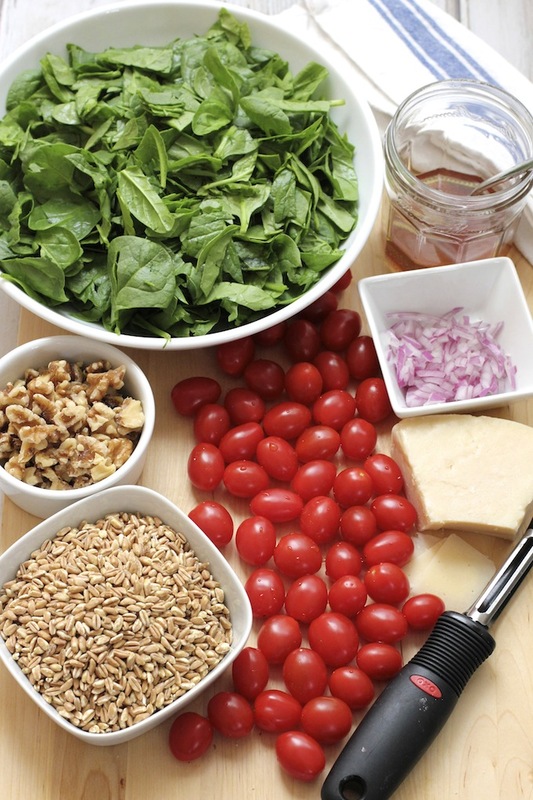 Add farro to the salad bowl with other ingredients and toss with dressing. Add parmesan and gently toss to combine. This is a delicious 1st course meal salad. I added some grilled chicken for the protein. Loved it. I wish the recipe included the calories. Thanks so much, Charlene – glad you enjoyed it. I am slowly adding calorie info to all my recipes – I’ll make this the next one that I do. This is a stunning salad! I love all of the flavors! Your photos are gorgeous too! This looks RIDICULOUSLY amazing – yum! Hi Alessandra – thanks so much – hope you try it and enjoy it! This looks so good, fresh and delicious and full of flavour – I adore salads like this! Thanks so much, Anna. Have a great day! This looks like such a flavorful and healthy meal, Geraldine! I love farro too, and definitely want to start cooking with it more. I live across the street from a Trader Joe’s (I am so spoiled, I know! ), so their 10-minute farro has caught my eye many times! I like how you used a veggie bouillon cube for a bit more flavor – what brand of veggie bouillon do you use? I haven’t found any I like yet. Hi Julia – I just use the Knorr brand bouillon since it’s easy to find. Definitely get the farro at TJs – I originally tried the barley and didn’t like it so I put off getting the farro. But the farro is great! Highly recommend it. Good to know, Geraldine – I will definitely try the farro! By the way, I just nominated you for the Liebster Award! Check out my most recent blog post for the details. Hi Thalia – I’m new to farro but I loved it. Will definitely be eating more of it in different salads. Have a great one. Very beautiful salad, I like adding farro to my salads too, I like that texture and how it keeps me full for hours! Hi Catalina – farro does have a great texture and taste and it definitely makes a filling salad! Have a good one and thanks for stopping by. Hi Arpita – go and get yourself some farro 🙂 – you’ll really like it. Have a good one. Looks delicious! I have never tried Farro, is it much different than rice? Hi Denise – it’s denser and chewier than rice. It’s kind of like barley but has a really great nutty flavor. I like it a lot. Have a good one. Well done, Geraldine! I don’t have a TJ close by but will be looking for some farro next time I am at the bulk section… Incorporating ancient grains into my diet is something I’d like to do more of. Love the combination of flavors in this beautiful salad. Thank you, Geraldine!! This salad looks fabulous! I love salads…I could live on them. I can hardly wait to try it. Recipes like this really get me excited. Thank you for making my day. Had never heard of farro before but it sounds marvelous. Thanks again. Hi Diana – farro is really great – filling and nutty and chewy – it’s a little bit difficult to find but give it a try if you can find it. If you have a Trader Joe’s near you you’ll be all set. Have a great day! I love the combo here! I always like seeing new ideas for salads especially when it includes gains to make it more filling! Thanks, Michele. I agree about new ideas for salads – there are so many great grains out there – I think I’m trying millet next.